Like Allusions, and The Affair, not enough recognition has been accorded to The Executives. They shared with those bands a polished, musicianly approach, although they fared considerably better than most of their contemporaries in the longevity stakes. They were also quite successful in commercial terms -- they scored several Top 40 hits, including two consecutive Top 5 singles in Sydney, and they were widely regarded as being Australia's most sophisticated pop group. They are also notable as one of the very first Australian groups to produce their own recordings. This polished sextet was founded by husband and wife Brian and Carole King in Sydney in late 1966, quickly gaining 'must-see' status around inner-city venues. Their musical expertise and versatility was unequalled for the time, and between them the six members could play thirty-one instruments, ranging from violin to harpsichord. In January 1967 they released their debut single, "Wander Boy" backed by a cover of The Addrisi Brothers' "You're Bad". The moody, wistful a-side was highly rated by Sydney radio DJs and sold well there. Around mid-'67 Dudley Hood, co-writer of "You're Bad", left to be replaced by guitarist Brian Patterson, who hailed originally from the Laurie Lee Ensemble (1963), then The Bluebeats (1965-66), and Tony Worsley & The Fabulous Blue Jays (1966). A second guitarist, Ray Burton (Raymond Doughty) also joined at the same time, replacing saxophonist Keith Leslie. Ray's antecedents include The Dave Bridge Quartet (1961-62) and The Telstars (1965). He had brief stints with Dynasty and The Questions in 1968 before returning to The Execs later that year. The other members of the Mark 1 line-up were virtual novices to the scene but acquitted themselves well in the professional Executives setting. It was the one-two punch of follow-up 45s in mid-'67 that cemented The Executives' reputation. "My Aim Is To Please You" was a beautifully arranged and recorded mid-paced ballad, which displayed to excellent effect the multi-layered twinned lead vocals of Gino Cunnico (formerly lead singer of The Affair) and Carole King, together with the deft electric piano flourishes of Brian King. An interesting piece of music 'trivia' about this song is that it was written by guitarist Kenny Young, who is best known as the co-author of the R&B classic "Under The Boardwalk". In the mid-'70s Young formed the band Fox (fronted by expatriate Aussie singer Susan Traynor aka Noosha Fox), who scored a major international hit with the song "S-S-S-Single Bed" in 1976. Many listeners mistook the Execs' new single for an American recording, perhaps by The 5th Dimension or The Mamas & the Papas (whose styles obviously had a strong influence on The Execs) before discovering to their considerable surprise that it was a home-grown product. "Aim" became a sizeable national hit, peaking at #26 on the Go-Set chart in September. It paved the way for their biggest seller, the lush, majestic Steven Stills song "Sit Down I Think I Love You" (originally recorded by Buffalo Springfield on their debut album). It was a Top 30 hit on most capital city charts during October 1967 and was especially successful in Sydney, where it peaked at #4, and it reached #28 on the Go-Set chart in December. During 1968 they released a trio of self-produced singles, making them one of the very first Australian bands to produce their own recordings. The first was the brisk and catchy "It's A Happening World" (March) written by Brill Building doyens Barry Mann & Cynthia Weill, which made the Top 40 in Sydney and Brisbane. The second was an irresistible slice of pure pop called "Windy Day" (June); originally recorded by US band The Lewis & Clark Expedition, it was another big success for The Executive in Sydney, where it reached #7. The third single was a glistening bauble of psych-pop whimsy, "Summerhill Road" (December), co-written by Ray Burton and Garry Paige, as was the single's flipside, "Christopher Robin". Garry Paige has a very interesting history -- while visiting the U.S. ca. 1967 he became friends with guitarists Steve Cropper of Booker T. & The MGs and Erik Braunn of Iron Butterfly. Paige owned a Vox wah-wah pedal and this novel device caught the attention of Braunn, who was so enamoured with it that he bought it from Paige and used it extensively on their famous LP In-A-Gadda-Da-Vida. Paige subsequently wrote with Russell Dunlop of Aesop's Fables and Flake, and enjoyed a long and successful partnership with Mark Punch, with whom he co-wrote the Renee Geyer hits "Heading in the Right Direction" and "Words Are Not Enough". In 1979 he teamed up with Kevin Borich for his Angel's Hand LP and he has since worked with Anne Kirkpatrick, Kim Hart and David Briggs of LRB. "They're the top group in New South Wales, and with "Windy Day" a bullet performer everywhere it's played, they look like staying that way. Their new jingle for Coca-Cola and their latest single ("Summerhill Road"), featured on the flip side of this disc which was written and produced by themselves will really knock you out!" Shortly after the early-1968 release of their eponymous debut LP, The Executives made the first of two forays to the USA, where they attracted encouraging industry scrutiny. They signed to the Buddha label and with the management team of DiBlasio, Wald & Day whose client list included Billy Joel, Helen Reddy and Tiny Tim (partner Jeff Wald was the husband of Helen Reddy). Unfortunately nothing came of the Buddah deal, so they eventually returned to Australia. But their absence did little to diminish their popularity in their homeland, where a further bunch of singles, EPs and another album fared well on the charts, and they remained a popular live draw. Their second album, On Bandstand, gathered many of their earlier hits, supported by a selection of well-chosen covers of contemporary standards, including several tracks from the hit musical Hair, and the LP confidently showcased the abundant musical strengths of the band. This collection has been re-released in various forms subsequently (see Discography). A second trip to America in late 1969 saw them absorbing the prevailing psychedelic-progressive trends; falling" into line with that maxim, they changed their name to The Inner Sense, adopting a heavier musical style but still retaining their trademark vocal polish. 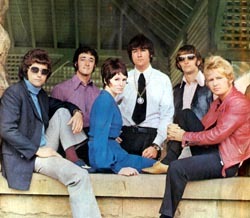 The Mark 1 line-up of the group lasted until late 1969. Unfortunately, new trends in progressive and heavy rock were making the smooth, breezy pop stylings of The Exectuives a thing of the past, and they were tagged as a "middle of the road" band in later years. Most of the group returned to Australia, and during this period Carole and Brian wrote, performed in and produced the music for the now-forgotten the stage musical Nuclear, of which former 60s pop idol Mike Furber was briefly a cast member, just before his tragic death. Ray Burton remained in America until 1973, and it was during that time that he co-wrote the international smash hit "I Am Woman" with Helen Reddy. On his return he became an in-demand session player and went on to work in several prominent groups -- Doug Parkinson & Friends and then McGuire, Kennedy and Burton (both 1973), which evolved into Ayers Rock later that year. He also formed a duo with ex-Executive Gino Cunnico that released one album in 1974. Gino later released two obscure solo LPs and Ray released his own. Ray continues a successful songwriting and production career to this day. Among his clients are Marcia Hines, Helen Reddy and Doug Parkinson. Carole and Brian King formed an aptly-name new group, Transition, which kept them going until they had found the right personnel with which to resurrect The Execs in June 1974. The new lineup included vocalist Jonne Sands, a former Sunshine label artist who at one stage was touted as a successor to Normie Rowe and who scored a lone a solo hit with "Mothers And Fathers" in October 1968. He took over Gino Cunnico's original role as co-lead singer with Carole, and for three more years this line-up enjoyed solid patronage around Sydney's club and cabaret circuit, and they released three singles on Polydor. They made regular appearances on TV variety shows and also wrote and recorded the theme music for Grundy's hospital soapie The Young Doctors. After The Executive"s folded for good in 1978, Brian and Carole King continued to team for studio sessions. Sands resumed a moderately successful solo career, mainly as a club performer. Bassist-guitarist Alan Oloman (formerly a member of legendary Lithgow band The Black Diamonds) continued with session work, contributing to Nuclear and wrote the music for the 1979 film Alison's Birthday. The Executives left behind a body of fine records that are highly sought after by collectors of quality sixties Aussie pop, although it has to be said that they have been lamentably overlooked in terms of CD reissues. Since the closure of Festival Mushroom Records in 2005 and the sale of its archive to the Warner group there has been little action on this front, apart from the recent reissues of the Split Enz catalogue. Nevertheless, The Executive should be remembered for their sophisticated and inventive sound, those gorgeous vocal harmonies, their accomplished musicianship and their mastery of the three-minute pop single idiom. "My Aim Is To Please You" / "Bad Reputation" // "Wander Boy" / "You're Bad"
"It's A Happening World" / Moving In A Circle // "Dedicated To The One I Love" / "Don't You Sometimes, Baby"
"Windy Day" / "This Town Ain't the Same" // "Friday's Child" / "Watermelon Man"
"Parenthesis" / "Got My Woman" // "Christopher Robin" / "Summerhill Road"
Various artists promotional compilation including Executives Coca-Cola advertisement and "Summerhill Road"